Predict the price of oil (OIL) from indicators such as the West Texas Intermediate (WTI) price, Henry Hub gas price (HH), and the Mont Belvieu (MB) propane spot price. Data is available for OIL, WTI, HH, and MB from the years 2000 to 2016 at the following link. Use the following nonlinear correlation with unknown parameters A, B, C, and D.
or kept in the original nonlinear form. Adjust the unknown parameters (A, B, C, D) to minimize a sum of squared errors of the normalized difference between the measured and predicted value. Normalize the difference by the measured value before the it is squared. where n is the number of data points, i is an index for the current measured value, pred is the predicted value, and meas is the measured value. Report the parameter values, the R2 value of fit, and display a plot of the results. 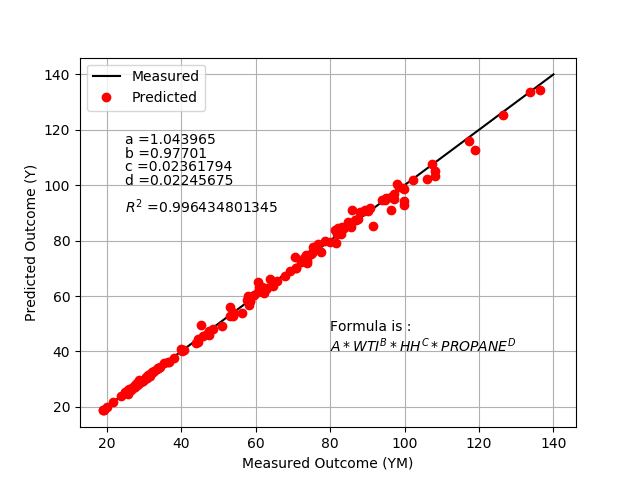 r"$A * WTI^B * HH^C * PROPANE^D$"
+ "A * WTI^B * HH^C * PROPANE^D"
Thanks to Fulton Loebel for submitting this example problem to the APMonitor Discussion Forum.